Hillary Clinton live-tweeted the fourth GOP debate Tuesday night per usual, highlighting subjects the top eight Republican presidential candidates failed to mention or why she disagreed with their stances on everything from immigration to big banks. As the debate came to a close though, Clinton gave an epic reaction to the GOP debate that perfectly summed up how I felt about the shindig. The best part was that the GIF was of Clinton herself shaking her head and looking despondent after more than two hours of Republicans talking about the evils of big government. Clinton had more reason than the rest of us to be frustrated with the debate, considering she was every candidates' main target — in the undercard debate alone, her name was mentioned 18 times (13 of which came from Chris Christie). Later into the primetime debate, Clinton tweeted: "Times Republicans offered helpful ideas for the middle class: 0. 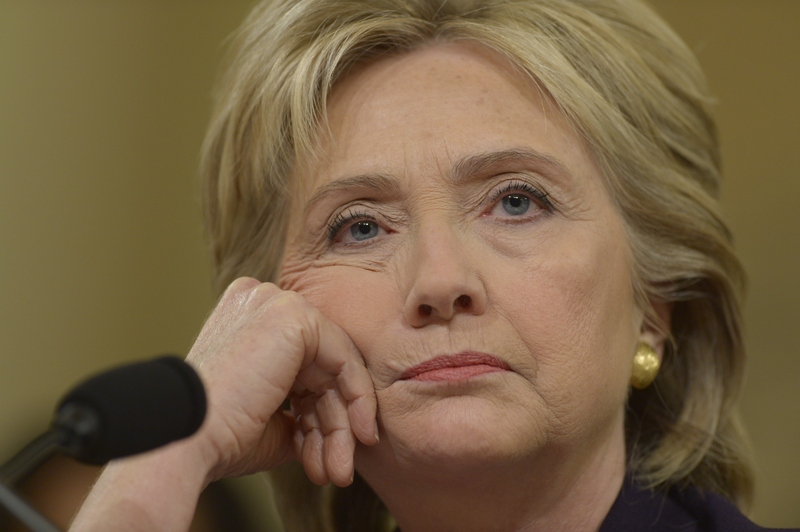 Times Republicans attacked Hillary: We lost count." She was even the subject of a question from the moderators, as Maria Bartiromo talked about her impressive resume and asked Marco Rubio: "Why should the American people trust you to lead this country, even though she has been so much closer to the office?" Obviously Rubio's answer was less than flattering. She must expect all the negative attention from Republicans as the leading Democratic candidate, but nonetheless, she was not amused. As Clinton noted, the Republicans talked about her way more than they did about certain important issues facing America, including women's issues. Yes, this debate was supposed to focus on the economy, but paid family leave is directly linked to jobs and the economy and not a single candidate called for it to be a universal guarantee. They spent so much time attacking a particular woman that they forgot (er, chose not to) stand up for the other millions of American women. So, Clinton's GIF perfectly summed up my feelings surrounding the debate and I shook my head right along with her. The Republican presidential hopefuls should spend more time on their policy ideas and less time bashing Clinton and "big government Democrats." If they really want to beat Clinton, it's going to take more than a few insults hurled her way — they'll need to get women voters on their side, which requires actually talking about women in GOP debates.